Baby travel systems are widely popular among new and experienced parents due to the convenience they provide. By having the stroller and car seat that doubles as an infant seat due to the stay-in-the-car base that it can click in and out of, parents aren’t having to move the infant around unnecessarily from car seat to stroller to infant seat. Take a look at the top rated baby travel systems and see why they are so popular with parents. The convenience and comfort they provide for parents and infants alike make these all-in-one travel systems one of the most sought after pieces of baby equipment. Learn about their features and benefits below. There are many different types of baby travel systems on the market today. Their price points range from low range to the top of the line systems so there is sure to be a baby travel system to fit every budget. You are getting 3 pieces of equipment in one which saves money on buying the individual items and the convenience factor is worth a lot too. This innovative tri-modal baby travel system provides three distinct ways to use it that adjusts to the growing needs of your baby as he or she gets older. The first mode is for young babies and is a car seat that has a canopy to protect your baby from excessive sun and other elements. Modes two and three include clicking the car seat into the stroller and also being able to be used as a baby carrier. The canopy can be removed and converts the car seat into an infant carrier. It is designed to be used exclusively with the Chicco Keyfit 30 infant car seat. The click-in attachment helps you go from car seat to stroller effortlessly. The one handed, free standing operation for folding the stroller makes it easy to get around quickly and efficiently. Once folded, the system will stand on its own and not flop over onto the ground so getting it into the trunk of your vehicle is much easier on your back too. The seat has multiple reclining positions that adapt to the needs of your baby. The handle of the stroller is adjustable making it work well for parents of all heights. The convenient parent tray has storage and cup holders for bottles, diaper bags and even a drink for mom or dad. The all-wheel suspension and linked rear brakes mean a comfortable and less jostling ride for your little one. It is the perfect all in one system that allows you to put your baby in the car seat, move them to the stroller for errands and then take them into the house or store in the same carrier so your baby isn’t disturbed if they fall asleep on the drive like so many babies do. 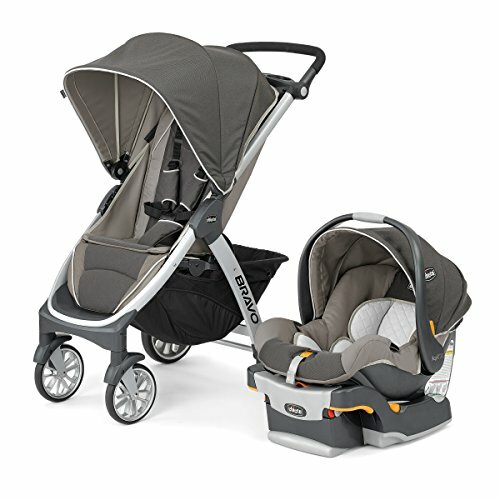 Get the ultimate performance baby travel system that includes a high performing jogging stroller as part of the system. This popular system includes everything you’ll need to include your baby in your on-the-go lifestyle. 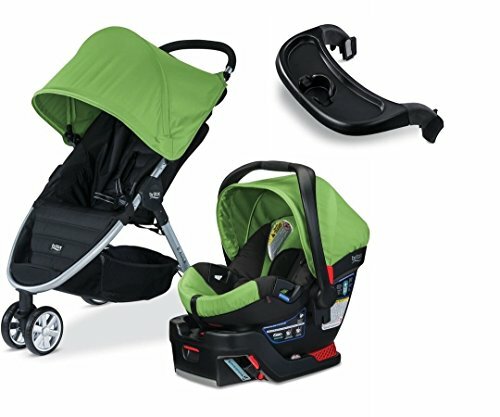 The top rated SnugRide Click Connect 35 Infant Car Seat attaches easily to the stroller in one secure step. The air-filled rubber tires, locking front swivel wheel with tracking, lightweight metal frame and exceptional suspension is the perfect stroller for the avid jogger or walker. The tech-fabric is reflective so you can easily b e seen even in low light conditions such as dusk or night time walks. The UV50 canopy allows your baby to be a part of the action while protecting them from harmful rays of the sun. The infant car seat is designed for infants weighing anywhere from 4 to 35 pounds and up to 32” long in the rear facing position. No adapters are needed to connect the car seat to the stroller. One easily heard click and you’re ready to go. You have everything you need to take your baby from car seat to stroller to infant carrier for running errands or visiting friends and family. The multi-reclining seat has a convertible 3 and 5 point harness that also has a safety tether so mom or dad feels secure about not losing control of the stroller. Total capacity of the Graco Relay Click Connect baby travel system is 70 pounds including a 50 pound child capacity. This system will work with the entire Graco click connect infant car seat line. The extra large storage basket makes carrying diaper bags, bottles, snacks and personal items easy and convenient. Fold up the stroller in one second with the one-hand fold feature that provides parents with the maximum convenience and efficiency. 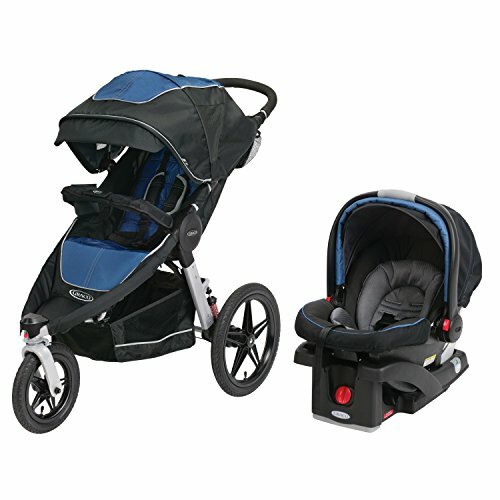 If you are an avid jogger or walker, you will love this Graco baby travel system and your baby will love coming along for the ride. This on the go travel system by Britax includes the B Agile stroller and B safe infant car seat that fit together to be one of the lightest weight and easiest to use travel systems on the market today. The convenient click and go system provides parents with a secure and speedy connection so the baby can be moved from car to stroller without disturbing them. Once they are too big for the infant car seat, you still have a terrific, stroller that has a weight recommendation of up to 55 pounds. The one handed folding operation makes setting up and taking the stroller down easy and efficient. The entire stroller weighs only 16 ½ pounds. The infant car seat features side impact protection and an energy absorbing foam liner which provides your baby with front, side and rear protection. The seat is padded, offering plenty of support for your baby. The 5 point harness system includes a supportive head pad for the early weeks and is adjustable without having to go through the hassle of re-threading or unhooking the straps. The extra large canopy has mesh ventilation so your baby gets plenty of air circulation while being protected from direct sunlight. The easy to use, push button latch connectors and ergonomic handle make transferring the baby from vehicle to stroller or vice versa simple and easy. The Britax travel system includes a stroller, infant car seat and car seat base so the seat can be used as car seat, stroller AND infant carrier. The weight recommendation on the B safe car seat is 30 pounds which is typically more than accommodating for the first year. Baby travel systems are very popular purchases for brand new parents because they provide convenience and eliminate the need for several different pieces of equipment. There are many different types of baby travel systems on the market in all kinds of price ranges, so finding what you want can be a lot easier when you have the right information. These top rated baby travel system reviews above and the convenient and informative buyers guide below combine to provide you with the knowledge you need to sort through the choices and find the one that matches your needs perfectly. A baby travel system may sound like something to do with traveling with your infant and in essence it does. Even if you are just traveling from the house to the grocery store, when you have a new baby, it can feel like you’re bringing the entire house with you wherever you go. A baby travel system is a combination of infant car seat, stroller and infant carrier. The infant car seat has a base that is placed in the vehicle (some models do not have a base, but the ones that have them are much more secure) that the seat usually clicks into. Once you get to your destination, you take the stroller out of the back, open it and take the infant car seat from its base and click it onto the stroller frame. The car seat can also be used as an infant carrier and go from car or stroller to the store with you. While it may sound confusing, baby travel systems actually make running errands and traveling with your baby much easier and that is why they are so popular with new and experienced parents alike. With this system, you don’t have to mover a possibly sleeping infant from one place to another, constantly disrupting their sleep. They get to stay comfortable and sleeping while you move their seat from one place to another. The first step that needs to be made before anything is purchased is determining what your particular needs are. With all of the different types of baby travel systems on the market, you need this information so you choose one that will accommodate your preferences and lifestyle. Here are a few questions you can ask yourself before you start your shopping. Will you be using the stroller often or just once in awhile when you go to the park or an outing? – This is one of the most important questions to ask yourself because how often you will be using the stroller portion of the travel system will dictate that type of system that will better suit your needs. If you are an avid outdoor type that jogs or walks on a daily basis, you will want to look for a baby travel system that incorporates a jogging stroller or heavy duty stroller that can handle uneven terrain. How big is your vehicle? – This may sound like an odd question but baby travel systems can be bulky, especially the stroller portion so if you have a Volkswagen, you may need to forgo the super duty, all-in-one, ‘has all the bells and whistles’ travel system for one that is smaller in size, not lower in quality. The strollers in these systems typically fold very easily, but you still need to make sure you have ample room to take it along with you when you want to use it. Do you have other small children? – If your children are close in age, you may need to look for a baby travel system that will accommodate twins. Even though you don’t have twins, the need for both young children to need the stroller is likely. A baby travel system for twins may cost more or you may decide that because you need a stroller for two, the baby travel system isn’t a good choice after all. Are you on the go a lot? – Even if you don’t plan on using the stroller portion of the baby travel system a lot, having a car seat that just clicks into the base and then unlocks to carry wherever you need to go is a very convenient feature. Babies often fall asleep in their car seats, so having the ability to just unsnap the car seat and take it into the store, rather than taking the sleeping baby out of the car seat (which will more than likely wake them) and moving them to a carrier and then back again when shopping is over is very appealing. The features list of most baby travel systems is quite extensive; everything from drink holders to attachable toys and everything in between. We’ve listed some of the most common features seen with baby travel systems. Decide which features are the most important to you before you start your search so you can eliminate the ones that don’t fit the criteria you have set. Restraint system – You have probably heard the term 5 point harness and 3 point harness. The ideal restraint system for your infant car seat and stroller is the 5 point harness. The 5 point system is the safest type of restraint available. It secures the baby right at the shoulders, at the waist and between the legs. This 5 point system prevents the baby from sliding or falling out of the car seat or stroller while it is moving. Babies wiggle around a lot so having that restraint system in place can prevent a lot of injuries. The benefit to the 5 point system is that, with the crotch strap that comes up between their legs to secure them, they will not wiggle right out from under the rest of the restraints. Wheels – The strollers that are a part of various baby travel systems can have many different types of wheels. Typical stroller wheels are good for most things, but if you will be jogging, walking for exercise, going to the beach frequently or otherwise having the stroller on uneven terrain, you will want to consider baby travel system strollers with better wheels for that type of ground. Air-filled is the most common alternative to the standard stroller wheel. Air-filled stroller tires are larger, have rougher texture and can typically ride easily over most types of terrain, even beach sand. Remember that with the air filled tires, maintenance will be required and they do have the ability to go flat but most parents feel the benefits outweigh the potential problems. Brakes – All strollers have brakes that are designed to keep the stroller from rolling when you don’t want it to. An additional feature that a lot jogging strollers have is a hand-operated brake for slowing the speed when you are jogging. This is especially good for jogging down inclines. Making sure that your baby travel system stroller has good quality brakes is important for the safety of your baby. Depending on the stroller, the brake may be a foot pedal that is pressed down to lock the stroller or it may be on the handle bar; sometimes both. Other models have a foot pressed brake for each tire. Look for the brake system that works for what you are looking for. Some parents don’t want to have to press down 4 separate brakes and would prefer the one brake at the back. Canopy – Canopies are important for protecting your little one against glaring sunlight or bad weather. They can be designed in many different ways such as a simple square of fabric that hangs down from a metal frame or pull down, full models that can cover the whole front of the infant seat. Some canopies flip from one side to the other which protects the baby from either direction the sun or weather is coming from. Some of the canopy designs have clear plastic windows where you can see the baby even when the canopy is up. These are very beneficial for constantly being able to check on your baby and make sure things are fine while you are out. Handlebars – The handlebars of the stroller and the handle of the baby seat are usually designed to be comfortable and convenient. They are padded, ergonomically designed and for the stroller, they are often adjustable to work for parents of different heights. Some of the handles on the strollers have the ability to flip over the top of the stroller and be used from the other side. One Handed- Open and Fold – Opening and folding your stroller should not be complicated and time consuming. When it comes to baby gear, the faster it works the better. In many cases parents are holding the baby in one arm while they work the stroller with the other hand. This one handed operation is necessary to keep things simple for the parent. Anyone who has struggled with a two handed operation when opening or closing the stroller can attest to this. Some models can stand up on their own once they are folded but care should be taken to avoid the stroller tipping and falling over onto a toddler or young child. Child’s Tray – Many of the strollers of baby travel systems have trays that can attach to the front of the stroller where the baby’s arms can rest or where toys can be attached. Some models have a grab bar as well as a tray. Look for systems where the child tray is removable in case you don’t want to use it or need it out of the way. If there are toys attached to the tray make certain that they are attached safely and that there are no small parts that can be a hazard. Footrest/Leg Support – Footrests help your baby sit comfortably in the stroller without having their legs just dangle unsupported. Some of the footrests on certain models are adjustable to allow for the baby’s growth. Fabric and Upholstery – The range of fabrics that the baby travel systems can have is vast. Ideally, despite the temptation to look at design as the governing factor, you want to look for a fabric that is easy to clean and wipe up. Look for seat covers on the infant seat and stroller that can be removed and tossed into the washer to get clean, but watch for fabrics that could have a lot of shrinkage or puckering. Make sure that you know how to reattach the covers after washing. Parent Tray / Cup Holder – A cup holder is an excellent feature to have on the baby travel system’s stroller. This allows the parent to carry a drink for themselves or to keep the baby bottle handy. They also usually have compartments for keys, wallet and other personal items such as a cell phone. Reflective Trim – Reflective trim or fabric enables the stroller to be seen even if the lighting conditions are not optimum such as foggy mornings or at dusk. If your stroller doesn’t have this type of fabric, you need to wear clothing that has it for your safety and your baby’s too. Extra large storage baskets – Most strollers have storage baskets underneath the seat for carrying diaper bags, extra clothing, a purse or any number of other things. The size of the basket your stroller has will vary, but the larger the basket, the more you can carry. Look for stroller baskets that can still be reached even with the baby seat reclined. Make sure that the stroller basket doesn’t drag the ground when loaded down. Also don’t hang diaper bags and purses from the handlebars, as this can tip the entire stroller. When it comes to making things easier for yourself as a new parent, it doesn’t get much better than getting a good quality baby travel system. They provide convenience, efficiency and comfort for both baby and parents. It’s hard enough to juggle all of the baby paraphernalia that a baby generates so having this travel system that combines three popular baby items into one system that goes from car seat to stroller to baby infant carrier with the baby not having to change seats once. The three top rated baby travel systems we have featured here are all from reputable names that are trusted in the baby industry. Any one of them would be an excellent choice for a new parent or an experienced parent that may want to upgrade their car seat and stroller situation for a new baby. The baby travel system will change the way you travel and run errands with your baby and make it much more convenient and enjoyable.